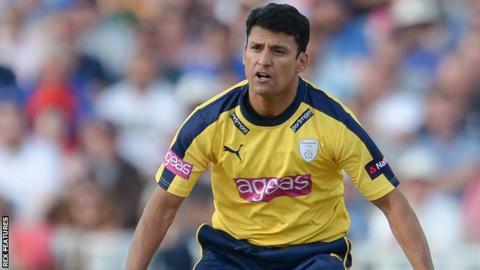 Somerset have signed Hampshire all-rounder Yasir Arafat on a season-long loan deal as a non-overseas player. The 34-year-old ex-Pakistan international made 22 first-team appearances for Hampshire last season. Arafat, who has a UK passport, returns to Taunton after playing for Somerset in their 2013 Twenty20 campaign. "We are absolutely delighted to have secured the services of another world-class player," said director of cricket Matt Maynard. "Hampshire signed Reece Topley from Essex and felt Yasir would not play a huge amount for them. The agreement was reached, it works well for both parties and there is no recall from them either," hetold BBC Radio Bristol. "We are really pleased Yasir is returning. He made quite an impression when he was last here and we are looking forward to seeing him do what he does best in a Somerset shirt." The pace bowler has played for four other English counties - Sussex, Kent, Surrey and Lancashire - during his career and is available for all Somerset's limited-overs games this summer.